Finding a new variation in the 1990 set is not generally big news, as tons of minor varieties pop up every day, such as hairlines in text, broken stat lines etc. New varieties featuring types of changes not previously seen before, are another thing. 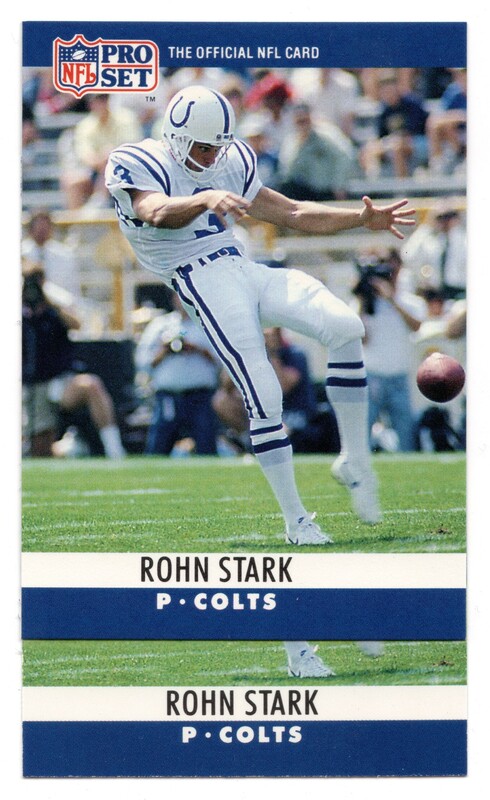 Notice how Rohn’s right foot lines up with the K in STARK on the first example and on the second, his foot lines up between the A and R in STARK. It appears as though Ron’s name was shifted to the left and eventually centered to fit the set’s format. Out of 43 copies, just 3 had the first type with his name shifted to the left. Is it rare? Not sure, because, as with 1990 Pro Set, a collector out there could have 40 copies of the left-shifted name and 3 of the centered-name type. Why is this a noteworthy find? This marks the first of this type of error. As far as I know, there are no previously documented variations that involve the placement of the player’s name in the team-color bar, which opens the door to the possibility that there are others out there. Thus creating a new variety type to be on the lookout for. I’d be interested in hearing of any other cards affected by this type of variation.